Last year Russia’s six major steelmakers cut 33,500 jobs from their payrolls, because, they explain, they are struggling to reduce losses and cut bank debt. 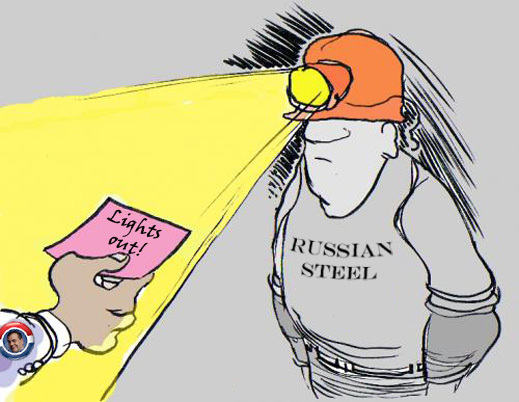 That amounted to a loss of almost one in ten jobs in the Russian steel sector. At the end of 2013, the headcount of steelworkers was 355,900, down 9.4% from 2012. Asked last week whether the Russian government has relaxed the earlier restrictions on payroll and job cuts, Maria Isyanova, spokesman for the Ministry of Labour and Social Protection in Moscow, refused to say. She also declined to provide her ministry’s employment figures. In 2013 Mechel, which is the most heavily indebted of the Russian steelmaking group, cut 18,900 jobs, 21% of its payroll in 2012. The next most indebted companies, Evraz and Severstal, cut 5,800 (5%) and 5,900 (9%), respectively. 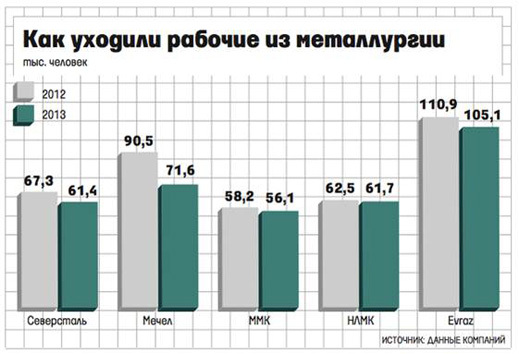 MMK reduced its complement by 2,100 (2%), while Novolipetsk Metallurgical Combine (NLMK) cut 800 jobs (0.1%). Evraz reports the largest headcount of the majors with a total of 105,000. According to the company’s annual report for last year, “the 5% decrease (from approximately 111,000 in 2012) was mainly caused by the initiated headcount reductions after shutting down and/or disposing of uneconomic facilities in the reporting period to improve productivity. Thus the headcount reduction at Evrazruda [mining subsidiary] amounted to about 3,000 employees and he disposal of VGOK [mining subsidiary] led to the loss of approximately 4,600 employees.” The Evraz financial reports do not disclose the wage bill of the group. Severstal does not release labour cost data, nor does its annual report for 2013 acknowledge the reduction of headcount. Instead, the company said its headcount for 2013 came to 61,230, of which 43,316 were in the Russian steel division and corporate headquarters; 2,135 in Severstal’s North American mills; and 15,909 in the mining division. Severstal’s controlling shareholder Alexei Mordashov explained in Moscow last week that there had been no social impact of the job cuts in Russia to date because of re-employment opportunities. Severstal is reportedly planning a further 2% to 3% reduction of the payroll this year (1,200) – without counting proposed sales of the two US steelmills in Dearborn, Michigan, and Columbus, Mississippi. For Mordashov’s US sell-off attempt, read this. The steelworkers union is playing down the significance of the job losses. Andrei Shvedov, Deputy Chairman of the Mining and Metallurgical Union of Russia, said: “This is not a dismissal, it is a release from production. It is connected with the sale and restructuring [of assets], including the optimization of the number [of workers] – that is, the reduction in the number of employees due to economic, technological, financial and organizational reasons. Business is changing and, in principle, changing the required amount of people that are needed in this business.” Last week in Moscow, Shvedov said, the union called a meeting of its regional representatives to discuss the future job picture in the steel sector with government officials. “We gathered about 100 people and together we considered these issues.” He did not say if the steelworkers are asking the government to protect their jobs, especially in companies like Mechel which are now being held back from bankruptcy by the state banks. Another Cherepovets local government official, who asked for anonymity, cautioned against viewing the unemployment rate as a reliable indicator of what is happening on the regional job market. “It’s rather difficult to find a good job in the district,” she said. Labour market sources claim that “releases” are generally organized by the mill managements so as to avoid the classification of the job loss as unemployment.